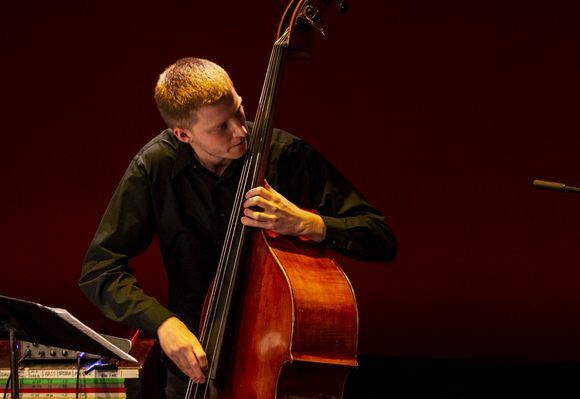 Kris Monson is a bassist and composer pursuing a Master’s of Music in Double Bass Performance at the Manhattan School of Music. A product of the rich central Virginia jazz community, Kris studied with bassist Pete Spaar and trumpeter John D’earth while an undergraduate student at the University of Virginia. After completing a double major in systems engineering and music at UVA, Kris has continued to play professionally all over the Washington, D.C. and New York City metropolitan areas in venues such as the Kennedy Center, Dizzy’s Club Coca-Cola, and Smoke Jazz Club. Kris currently resides in New York City and is in his final semester at MSM, studying under the tutelage of Buster Williams, Orin O’Brien, David Grossman, Stefon Harris, Phil Markowitz, and Jim McNeely. As a composer, he has premiered works at the Banff International Workshop in Jazz & Creative Music, Sewanee Summer Music Festival, and the Manhattan School of Music.